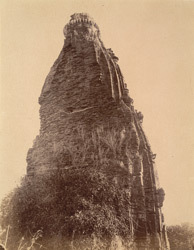 This photograph shows the upper part of the tower belonging to the brick temple at Seori-Narayana, taken by Joseph David Beglar in 1873-74. At Seori-Narayana the two largest temples face each other, one made of brick and the other of stone. The brick example is pictured here overgrown with vegetation. The tower stands above the sanctum, both of which date to antiquity. Out of view, to the left stands the mandapa, which is a relatively modern construction. The temple's sanctum is built to an unusual plan being circular with the corners cut off. The local people told Beglar that the statue in the temple was a depiction of Vishnu but he believes that it shows Aditya. The temple's decoration was never finished as many of the sculptures around the doorway are incomplete. Inscriptions date the oldest parts of the temple approximately to the ninth century.